Crystal Mooncone shared a post. Crystal Mooncone (Stephen Rush, Chris Peck, Jon Moniaci) is included in this year's Grammy Awards balloting round for "Escape Beam Five"! 1 year 6 months ago. Crystal Mooncone is at University of Illinois School of Music. Show at University of Illinois at Urbana-Champaign, music building auditorium, tonight, 7:30pm! 1 year 6 months ago. Crystal Mooncone is at MSU School of Music. Sound check at MSU Cook Recital Hall. Show tonight 7:30pm, New music at MSU. 1 year 6 months ago. Look out! Crystal Mooncone (Stephen Rush, Chris Peck, Jon Moniaci) on tour this week & CD Release Party! : Oct 18: Michigan State University, Cook Recital Hall. 7:30pm. Oct 19: E. Lansing open jam @ Beggars Banquet. 7-9pm. Oct 20: University of Illinois at Urbana-Champaign, Music Building Auditorium. 7:30pm. Oct 21: CD Release/House Party in Ann Arbor. 7:30 (contact band for info). 1 year 6 months ago. Crystal Mooncone (Stephen Rush, Chris Peck and Jon Moniaci) is an electroacoustic band with a psychedelic sensibility, mixing playful interaction with committed listening and melding virtuosic musicianship with a taste for risk. In the ten years they’ve performed together they’ve developed a compositional process akin to Zen calligraphy -- a blend of spontaneity and precision. The trio plumbs the unknown through this process, honing their collective musical decision-making while still delighting in the unexpected. The result is a rich, textured sound that blends old and new technologies, hi-fi and lo-fi, acoustic and electronic, analog and digital, familiar and unfamiliar, nostalgic and futuristic. Instruments such as piano and flute collide with hardware and plumbing supplies. Whimsical instruments like slide whistles and bike horns take on serious prominence (with echoes of the Art Ensemble of Chicago). Crystal Mooncone conjures cinematic landscapes anchored by moments of exquisite sonic detail and musicality. 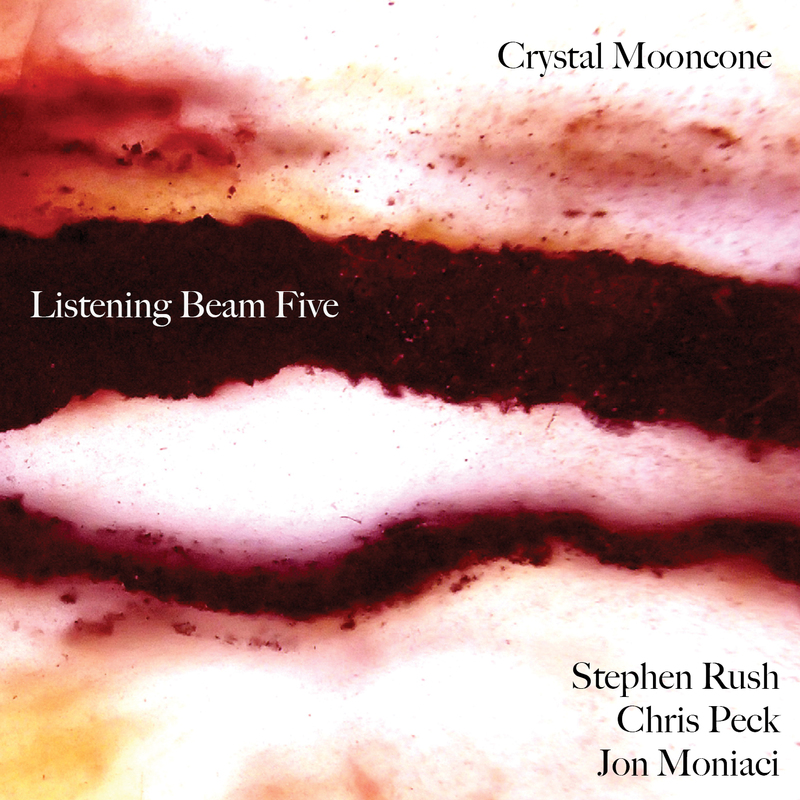 Listening Beam Five is Crystal Mooncone’s fifth album, following Escape Cone Listening Beam 4 and Escape Cone Listening Beam III released by Deep Listening. Each member is an accomplished composer and artist in his own right. Rush is a Professor of Music at the University of Michigan and has performed with Roscoe Mitchell, Pauline Oliveros, Elliott Sharp and more, including orchestral, chamber and solo works on over 30 CDs. Peck has a longstanding engagement as a collaborator with contemporary dance and performance companies in Los Angeles, Brussels and elsewhere. He teaches music courses at the Global Arts Studies Program at the University of California Merced. Moniaci also frequently collaborates with dance makers. In 2011 he received a New York Dance and Performance “Bessie” Award for his score for choreographer Beth Gill’s Electric Midwife. Stephen Rush is a Professor of Music at the University of Michigan where he founded the Digital Music Ensemble over 25 years ago, premiering works by La Monte Young, John Cage and Philip Glass. As a performer he has worked with Roscoe Mitchell, Pauline Oliveros, Eugene Chadbourne, Steve Swell and Elliott Sharp, and has orchestral, chamber and solo works recorded on over thirty CD’s. He is also the author of “Free Jazz, Harmolodics and Ornette Coleman,” a book of extensive interviews with Ornette Coleman and analyses of compositions/transcriptions of Harmolodic music. Chris Peck is a composer, computer musician, improviser, and songwriter with a longstanding engagement as a collaborator with contemporary dance and performance. Recent projects have included co-creations of music-dance works with LA-based choreographer Milka Djordjevich (MASS at The Kitchen, NYC in 2015) and Brussels-based choreographer Eleanor Bauer (MEYOUCYCLE at Kunstenfestivaldesarts in 2016). Peck teaches music courses at the Global Arts Studies Program at the University of California Merced, where he also directs the Experimental Inter-Arts Ensemble. Jon Moniaci is a composer, musician and software engineer who frequently collaborates with dance makers. His music incorporates acoustic and electronic textures and often relies on flexible and improvisatory structures. In 2011 he received a New York Dance and Performance “Bessie” Award for his score for choreographer Beth Gill’s Electric Midwife.